It seemed like just another day in early childhood education at Learning Adventures Rotorua's Kea Centre. It seemed like just another day in early childhood education at Learning Adventures Rotorua’s Kea Centre. One child asked for piggybacks, one showed off his new dinosaur toys while another pointed to Batman on his shoes. But if you looked beyond the children’s gate, there were a few extra adults on board dressed in BNZ t-shirts. Agribusiness partner Nicky Aislabie and most of her Rotorua colleagues spent the day educating preschool-aged children, teenagers and the elderly about financial literacy as part of BNZ’s Closed for Good initiative. BNZ claims its Closed for Good initiative is the largest single corporate volunteering day in New Zealand. Aislabie was one of two volunteers allocated to Learning Adventures from 9.30am to 2.30pm yesterday. They set up an activity area on the mat at 10am to hold seven sessions with the kids across the day, explaining the difference between needs and wants, with the story of Penny the Penguin. Learning Adventures Rotorua’s Kea Centre kids listening in. Penny, a friendly blue penguin or korora, was a keen sailor, that needed to trade stars for supplies to fix her broken boat. Aislabie said this was her fourth year involved in Closed for Good with past visits to Riding for the Disabled and the Te Amorangi Trust Museum in Holdens Bay. She was pleased to see this year the volunteering was focused on financial literacy. Centre manager Raewyn Farrell said the Kea Centre’s 50 students “love people coming in”. She said the money messages would stick. 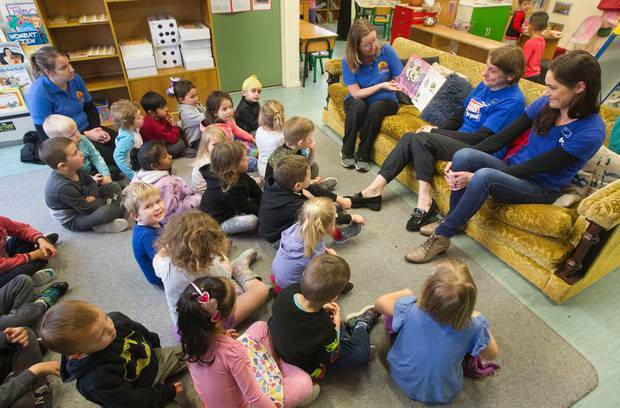 Thousands of pre-schoolers and high school students will learn about financial literacy as part of BNZ's Closed For Good volunteer day this year.